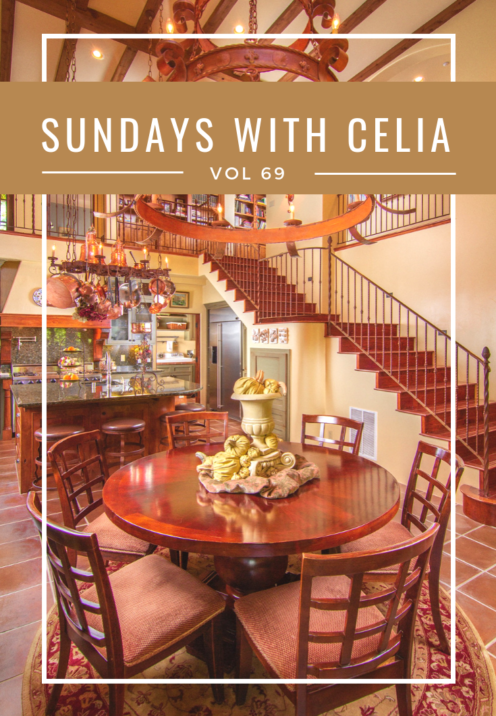 Welcome to Sundays With Celia Vol 69 and Happy post Thanksgiving! I hope you are enjoying a wonderful holiday weekend with all the people you love. This week on the blog I told you all about what I’d like to in my next life, in other words, what I’d do if I had it all to do over again. Read the post here if you missed it. You may be very surprised to learn what I’d do. What would you do if you had your life to do over? Naturally Thanksgiving is all about gratitude. So, I saw something that stopped me in my tracks on the Instagram account of a favorite blogger, Camilla Styles, that said, “Gratitude Turns What We Have Into Enough”. Doesn’t that just sum it all up perfectly? 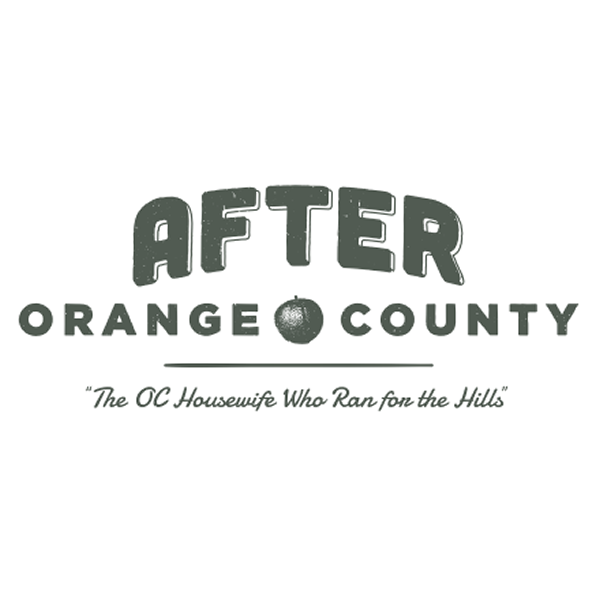 You know, when I look back at the life I had in Orange County, before moving to Lake Arrowhead, it was all about a very plastic life of keeping up with the Joneses and making impressions. All anyone cared about was who had the grandest home, the largest diamond ring, the fanciest party, and the biggest bank account, and I soon realized that just wasn’t me. While I really love my stuff, I want to be liked for me, and for what I can give to others. I’d rather be known for a generous heart than the square footage of my home. And as I age I try to remind myself that less really is more, that I really do not need for anything material, and that what I already own really is ENOUGH! That I really should be grateful for what I already have and call it a day. 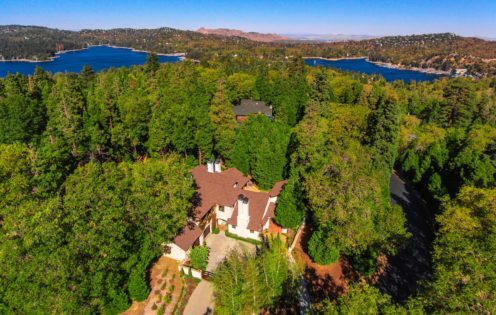 So the home we own in Lake Arrowhead truly is MORE than enough! 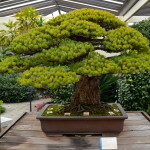 It is about 5100 sq. ft., but we designed that square footage to accommodate exactly the way we live, the way we work, and the way we entertain. Every single space was meticulously thought out to provide for what we like to do, to house our possessions, to accommodate our family and guests, and to seat them at our table. I haven’t shared a lot of photos of our home since I started blogging because I’m not great at taking photos of interiors. That takes a certain expertise. BUT, we recently had professional photos taken of our home, BECAUSE, we have decided to sell it. Yes, after 13 years of loving our “Mediterranean Meets The Mountains” style home, we are hoping to pass it on for someone else to love. I put my heart, my soul, my blood, sweat, and tears into this home, but we’ve decided it’s time to move on. 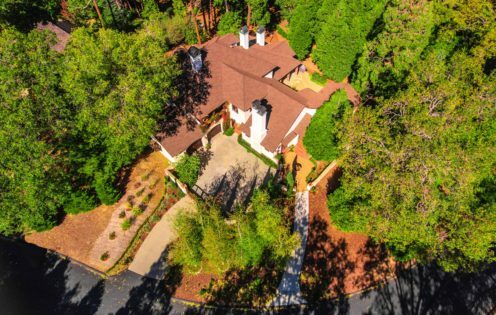 Because less is more, and because we are empty nesters, and because the space is now more than we need, and because we are 3,000 miles away from all 5 of our children and our 2 grandchildren, we have our home on the market. So come on in and let me show you around. 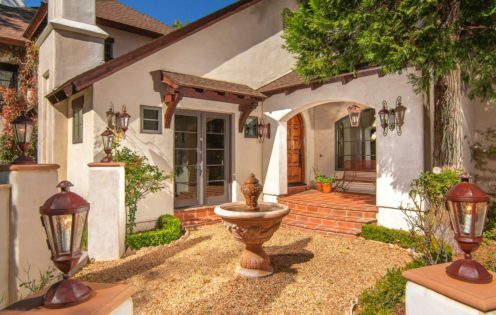 In the photo above you can see the entry courtyard with the fountain that I often show on the blog. It’s a favorite spot for birds to visit. The arched front door is reached via the covered front porch. Just inside the door you’ll find the spacious foyer. The flooring is from Walker Zanger’s Alhambra Collection and is inlayed with Verde Italian Marble. One of 2 staircases in the home winds up to the second floor. Each stair tread is ornamented with hand painted Walker Zanger tile. The handrails and pickets are custom made, hand-forged wrought iron. 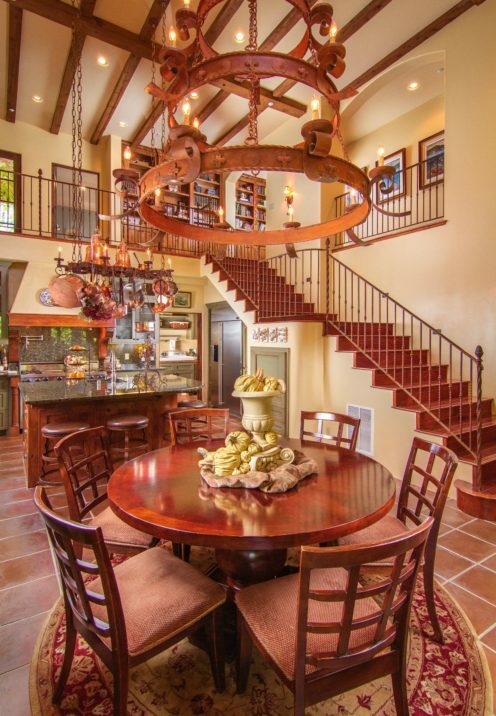 The Dining Room lies to the left and the Bar is to the right. Let’s step into the Bar next. In designing our home we decided we wanted a bar for entertaining instead of a Formal Living Room. We start all of our dinner parties with cocktails in the Bar, and sometimes even have small dinner parties there, especially during college basketball season when we invite friends over to watch our team, Duke. 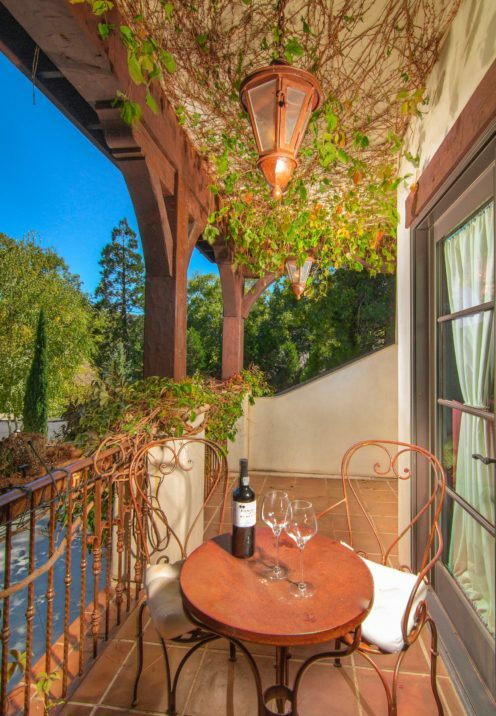 The door you see just to the left of the fireplace leads down to our Wine Cellar. The ceiling in the Bar is 25 feet tall and is crowed by hand troweled wooden trusses. 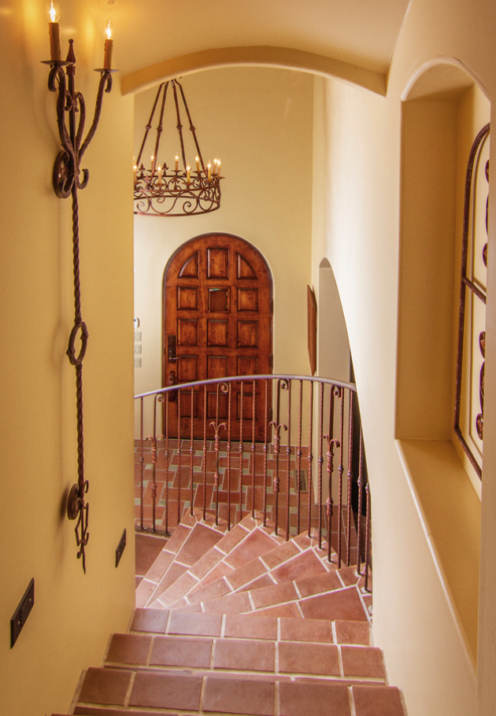 I designed all of the light fixtures in our home and had them custom made by a very talented artisan in Mexico. So, they are all completely custom, one of a kind fixtures. I wish it showed in the photo, but high above there is a small stained glass window depicting Saint Cecilia, the saint of music and my patron saint. She is watching over the home we love. Next let’s have a look at the Dining Room. As you know if you follow along here, we entertain frequently, so it was essential that we have a large Dining Room to accommodate a table for 12. I also own far too many sets of china, with a collection I inherited from Denmark, another antique set I collected from Japan & another I purchased on a trip to Russia. I also have collections of silver from Latin America, so to house it all I had French style, hightop cabinets built-in, which flank either side of the fireplace. Having a fireplace in the Dining Room makes for really enchanting dinner parties, and keeps things cozy and warm on cold winter nights. 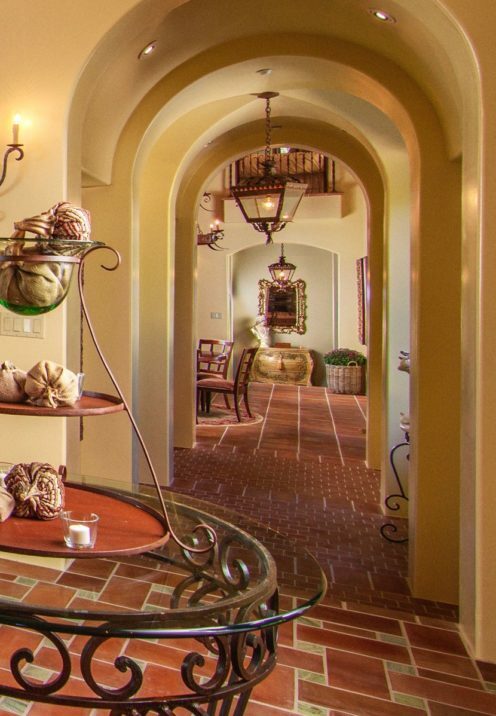 Now let’s head down the arched, double-barrel, Gallery hallway, which leads to the Kitchen Great Room. We designed the hallways in our home to be extra wide and spacious, which I believe is always a good use of square footage. 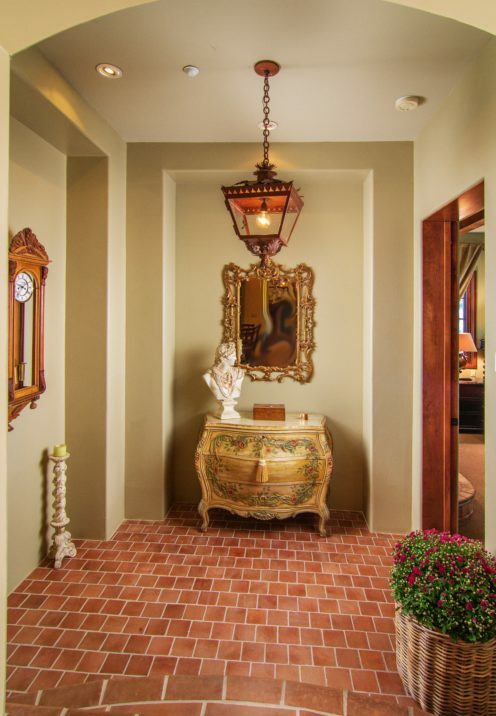 Wide hallways always signify elegance and quality. 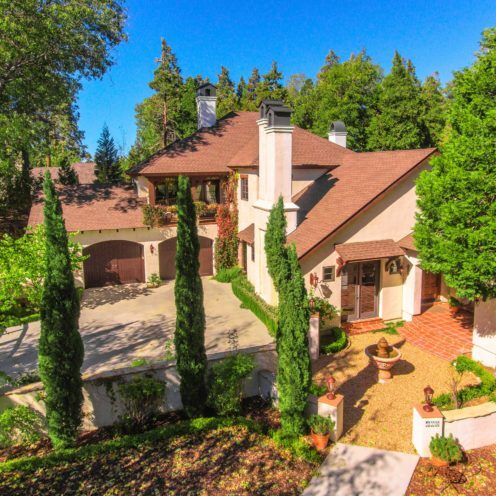 My Mediterranean Style home is actually quite unique here in Lake Arrowhead, where English Tudor and French Chalets are the norm. 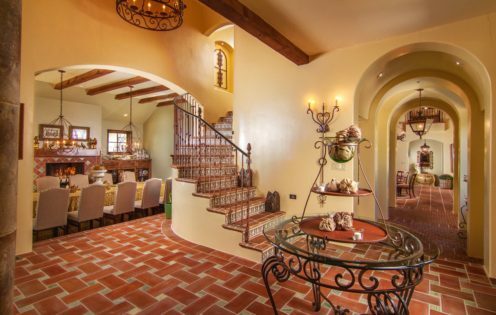 But in building my dream home I wanted a home that would speak to my Spanish heritage. I had actually hoped to build my home around an open courtyard, but when my builder, the renowned Ron Dolman, and esteemed architect, Tom Greer, told me that wasn’t possible because of the limitations for snow removal, we nixed that idea. So, we kept the courtyard esthetic here in the Kitchen/Great Room, which is open to soaring ceilings, an open staircase and even a Juliet Balcony above, giving it the illusion that it is actually an outdoor courtyard area. The centerpiece of the room is the immense, 3-tiered, hand-forged, wrought iron chandelier which is the crowning jewel of the room. 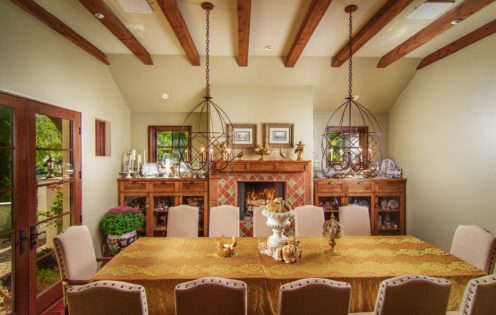 All of the solid wooden beams in the ceilings throughout the house were milled from 52 trees that were cut down on our property when building our home. I love that these old-growth trees can live on in our home in the place where they were born and lived for decades, and now grace our property in a new way. 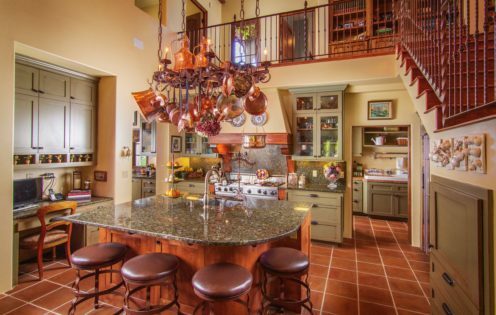 A custom iron pot rack hangs above the large island that seats 4. There is an extra deep stainless steel sink in the island along with a Bosch Dishwasher. Behind it is a 48″ Viking Range with Griddle & Grill. 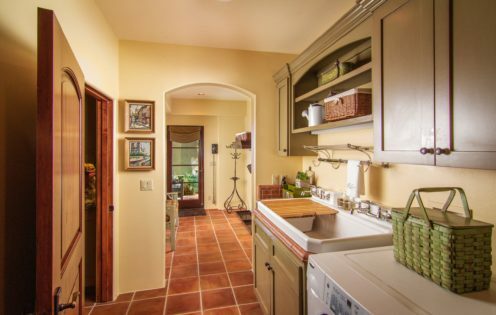 There is also a huge walk-in pantry with custom built-in cabinets, a large spice cabinet, a cookbook cabinet and desk area, and a stainless steel, built-in GE Monogram Refrigerator/Freezer. The kitchen area then opens into our Family Room, where the family gathers to watch TV & movies, and is a stand-in for the formal Living Room we don’t have, and don’t miss. 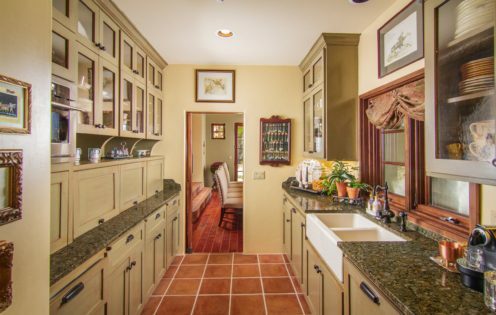 Conveniently separating the Kitchen from the Dining Room is the Butler’s Pantry. Here I have a Kohler Apron Sink, a second Bosch Dishwasher, 5 Appliance Garages, generous storage, and lots more work and service surfaces, which makes entertaining seamless. Now lets back up and take another look at the photo taken from the foyer. 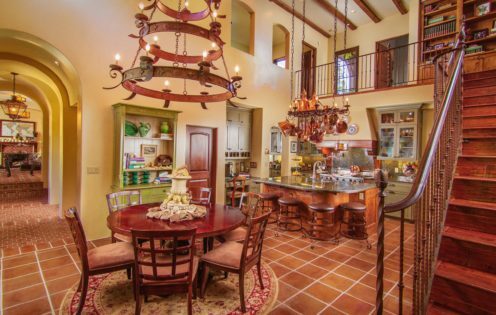 You see the Gallery, then the Kitchen/Great Room, and then you will see a Vestibule. That Vestibule leads to the Master Bedroom, which is on the main floor of our home, a feature many people are looking for now-a-days. I love vestibules and here too, believe they are a good use of square footage because they add perceived value. That perceived value comes in the form of the perception of elegance and graciousness. Plus, it’s just so nice to have a space between rooms so one does not simply walk from a room, thru a door, into another room. 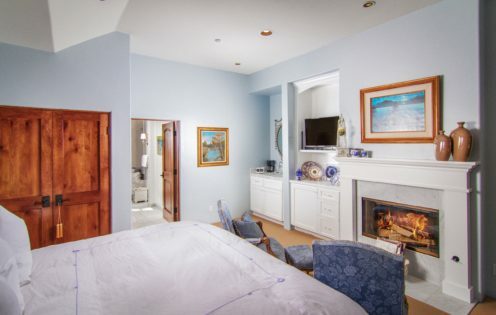 So in this case, we have a little anti-room if you will, between our Master Bedroom and the Great Room. It makes all kinds of sense, yet vestibules are often overlooked. Also notice the extra tall door leading into the Master, another subtle but special feature. 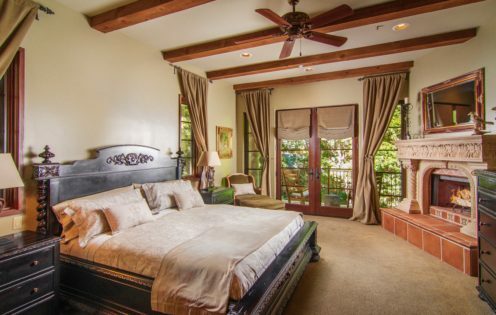 And here you have the Master Bedroom. It too features a Fireplace, one of 5 in the home. 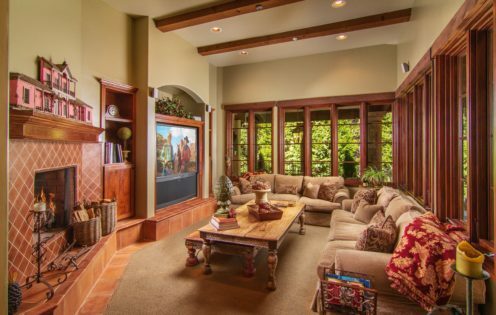 French doors lead out to a covered loggia that overlooks the 1.3 acre forested property. 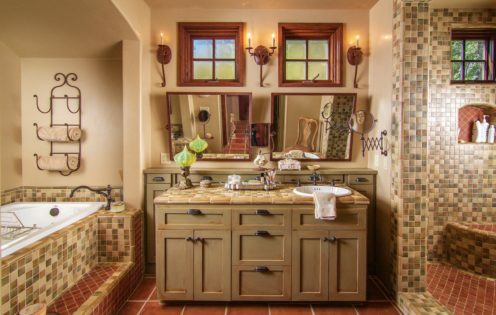 Anther area of the home where we splurged on square footage is in the His & Hers Master Bathroom. 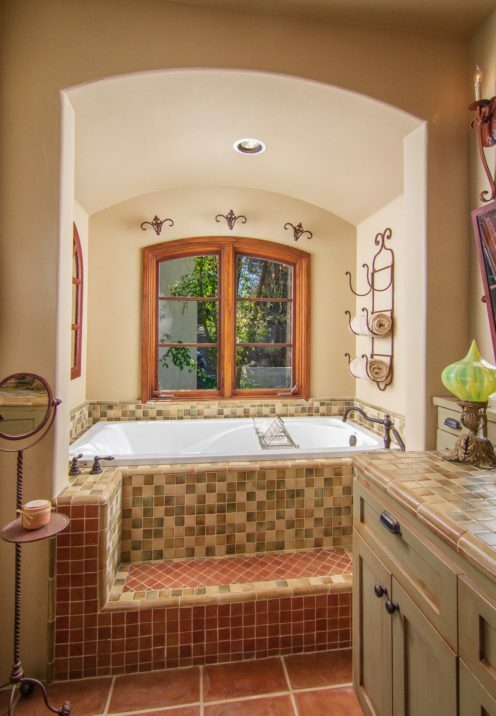 This is Brad’s side of the Bathroom, where he also has a private toilet room and large walk-in closet. 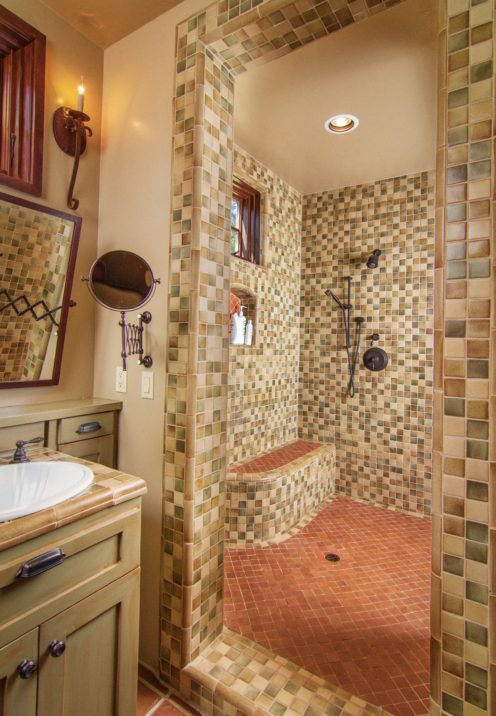 This is my side of the bathroom where we meet in the middle with a duel-headed shower. 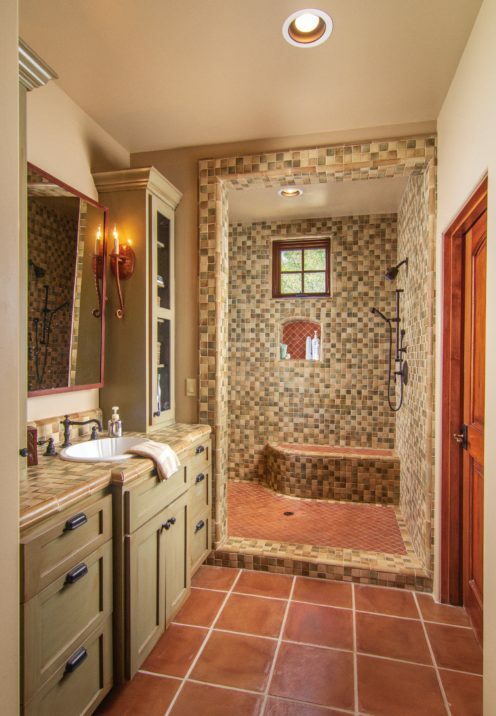 I used a 1 inch Mosaic tile by Walker Zanger in the bathroom to give it a spa-like appearance and ambience. On my side of the Bathroom I also have a private toilet room with a bidet, a very spacious walk-in closet and a jetted tub. The cabinet pulls and knobs are by Restoration Hardware, as is the extension magnifying mirror. All of the light fixtures and mirrors are my custom designs. The faucets and shower hardware are Newport Brass in Oil Rubbed Brass. The Master Bath connects to my office, the Laundry room and the Mud Room beyond. Now lets head upstairs where there are 3 bedrooms. 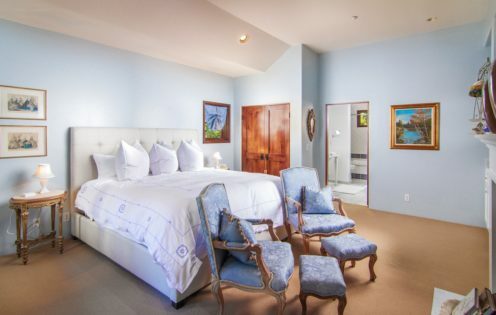 Lets start with the primary Guest Room. The color scheme is a departure from that of the rest of the house in a soothing blue and white. 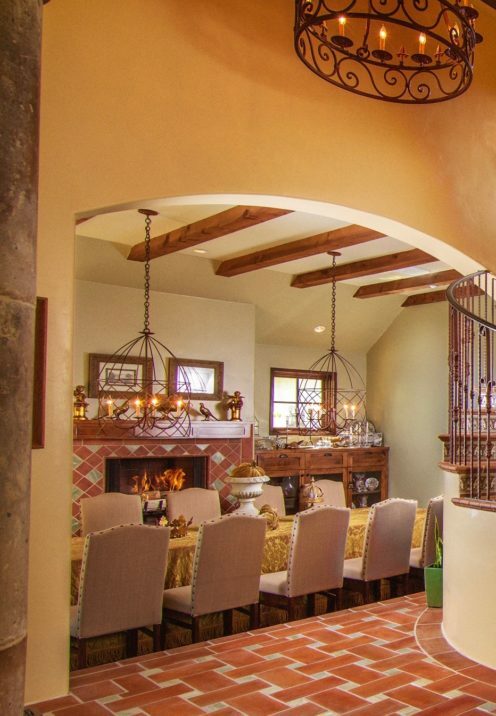 Here too, our guests can enjoy the 5th wood-burning fireplace in the home. 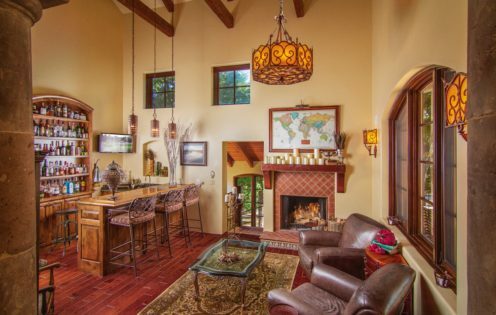 There is also a wet bar, a coffee bar and a mini fridge to provide our guests with all the comforts of home. 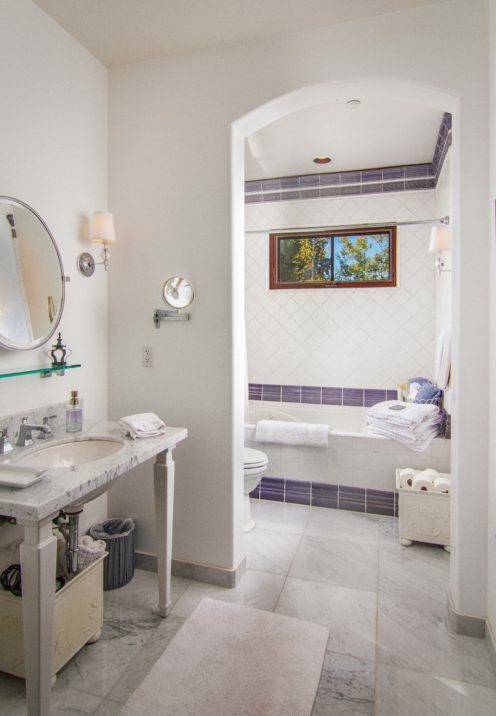 The bathroom features a Carrera Marble Pedestal Sink with Porcelain legs by Kohler, Carrera Marble floor, and a jetted tub/shower combo that is tiled in Walker Zanger tile. 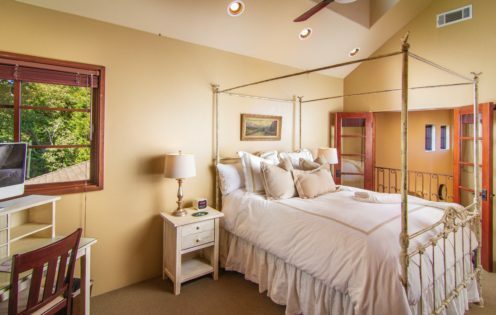 The Guest Room also has French Doors that open onto a private balcony with beautiful forest views. When we built our home we still had 2 boys at home. For our youngest I designed the fishing room, a sport he enjoys on nearby Lake Arrowhead. I designed and built the 4-Poster Bed out of fence post materials. 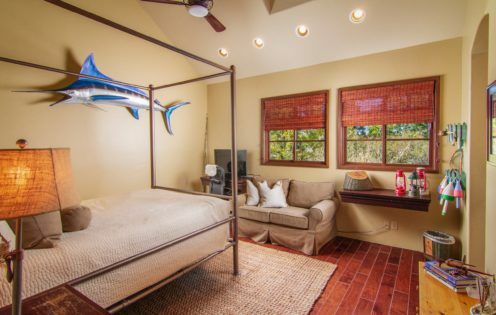 The marlin on the wall was caught by my father in Mexico, and the couch and lamp are by Pottery Barn. The seagrass rug is from World Market. This the 3rd bedroom, which I recently remodeled just before my middle son’s recent marriage, which took place here at our home. I wanted his bedroom to be more inviting to his wife, so I feminized it a bit. This is the room that has the Juliet balcony that overlooks the Great Room below, a really stunning feature. There is also a bonus room that we use as a gym and theater room upstairs, as well as my husbands office, neither of which I have photos of. So now let’s go back downstairs and I’ll show you the exterior of our home. 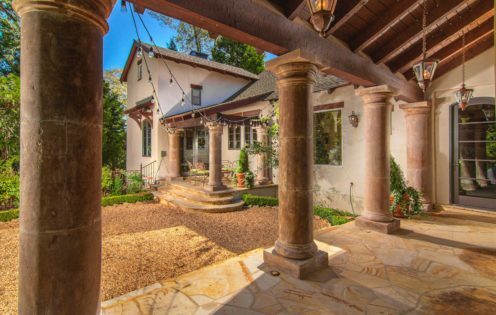 Exiting off the Great Room you arrive in the rear Courtyard and Covered Loggia. 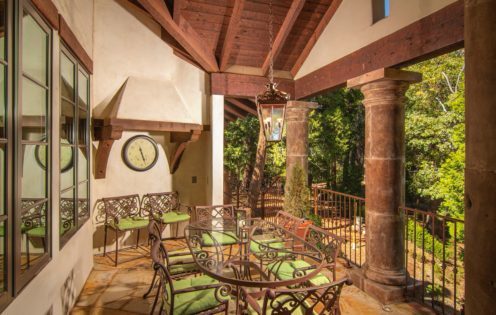 I had 23 custom Canterra Stone Columns manufactured in San Miguel de Allende, Mexico and imported them for use both inside and outside our home. Colorado Buff Flagstone is installed on the patio floors and loose polished pebbles are in the Courtyard. Just around the corner is our Dining Pavilion where we enjoy wonderful alfresco meals in Spring and Summer. Stepping to the front of the home you can see we have a large, walled-in, motor-court with an attractive and stately gate. 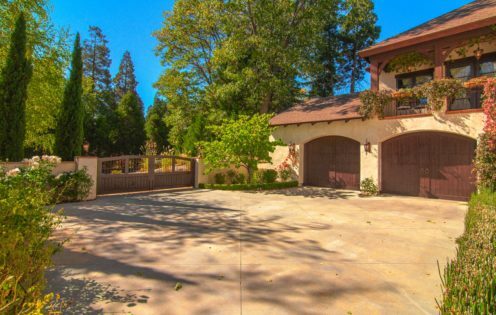 The oversized garage accommodates 3 cars and is complete with builtin storage and a workshop. 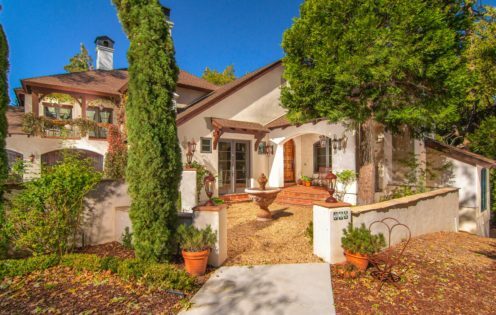 Our home is listed for sale with Lynne B. Wilson. Please contact her here for more information.